Stock market dispersion is widening as technical indicators show sell signals, suggesting a turbulent road ahead for equities. John Hussman, an investment manager, says these indicators haven't flashed simultaneously since early in the financial crisis. All is not well beneath the surface of the stock market. Market dislocations are running rampant, suggesting turbulence ahead that could go well beyond the modest weakness that major indexes have seen over the past two weeks. And to make matters worse, some of the market's most ominous technical indicators are flashing serious warning signals. John Hussman, the president of the Hussman Investment Trust and a former economics professor, is particularly concerned about the growing dispersion of stock market returns. Dispersion, which reflects how widely market returns are distributed, is an important measure to watch to assess the crosscurrents that drive broader indexes. On Tuesday, the number of New York Stock Exchange companies setting new 52-week lows climbed above the number hitting new highs, representing a "leadership reversal" that Hussman says highlights the deterioration of market internals. 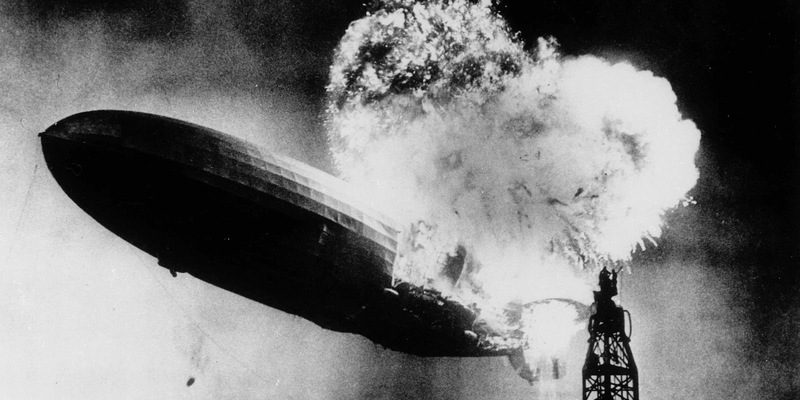 Stocks also received confirmation of two bearish market-breadth readings known as the Hindenburg Omen and the Titanic Syndrome. Hussman says these three readings haven't occurred simultaneously since 2007, when the financial crisis was getting underway. It happened before that in 1999, right before the dot-com crash. That's not very welcome company. "While the names of these indicators may seem silly and overly menacing, they actually get at something very serious," Hussman said. "They capture situations where the major indices are near new highs, yet market internals show much greater divergence. In my view, this type of market behavior is indicative of a subtle shift in the preferences of investors, away from speculation and toward risk-aversion." 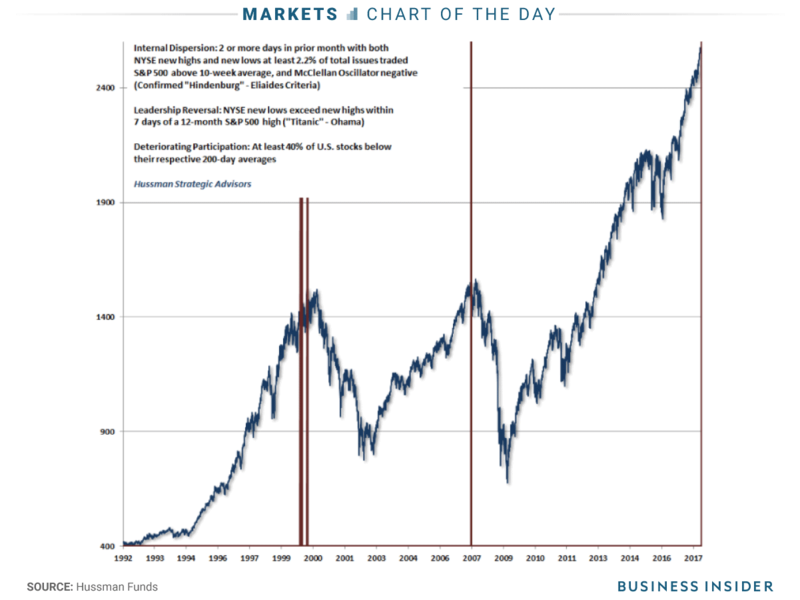 However, Hussman has for years been sounding the alarm on a major stock market sell-off. In a recent blog post, he said Wall Street had "gone completely mad" as investors continue to buy stocks at stretched valuations, and he predicted negative equity returns over the next 10 years. Throughout the second half of 2014, he issued regular warnings about a crash, even going as far as to say stocks were crashing that October. The S&P 500 has rallied another 30% since then. Hussman's view also stands in stark contrast to that of many experts across Wall Street — most notably the equity strategists responsible for each firm's S&P 500 forecasts. They forecast the benchmark will be little changed from current levels into year-end, according to data compiled by Bloomberg. Looking ahead, UBS sees the S&P 500 climbing as much as 9% in 2018. Meanwhile, Goldman Sachs thinks US stocks will be kept afloat by speculation and progress in overhauling the US tax code. With all these varying opinions floating around, it's easy for investors to get confused. At this point, it seems as though the best approach for even the most bullish investors is to proceed with caution.